When your waste container is full, please complete the Waste Pick-Up Form to request a waste pick-up. The waste pickup request form is a University of Delaware web form. To use this form you must log in using your UdelNet ID and Password. You will be asked to provide the following information: your name, department, phone number, location of the waste, and the quantity of waste to be picked up. Waste is picked up from locations on a weekly basis. If you are unable to complete the form, please contact the Department of Environmental Health & Safety at 831-8475. 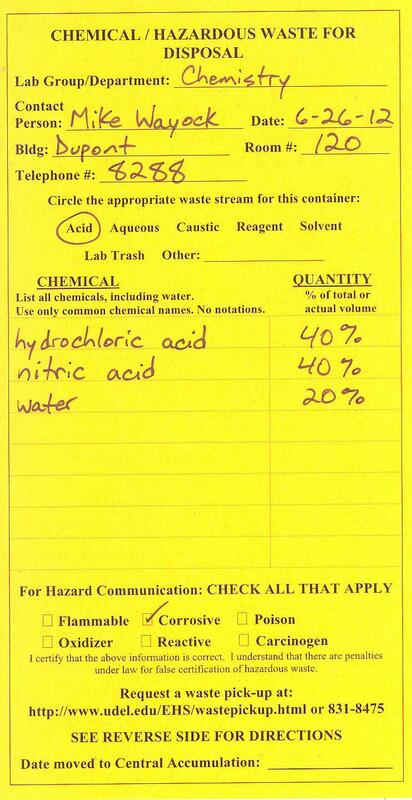 Questions regarding chemical waste disposal may be addressed to EHS or call 831-8475.